The Olympic break for the NHLers who weren’t called to represent their country’s teams has came and passed, and luckily the Colorado Avalanche didn’t skip a beat getting back on the ice and setting a franchise record in earning 40 wins. In their first game back together, the Avs built up a 4-2 lead on the LA Kings, but let it slip away after a Kings rally late in the 2nd period spilled over into the 3rd. The Avs lost 6-4. Semyon Varlamov had the night off so JS Giguere got the start and stopped 22 of 27. Then the Avs won three against Phoenix, Tampa Bay and Chicago. The Chicago game became their franchise record fastest to 40th win. Though the game has changed some, it is still impressive that the 2013-14 Avs have bested the 1996 and 2001 Stanley Cup teams in one regard. Tuesday night in the Windy City, the Avs leave Chicago with a 3-1 record against the Blackhawks this season with one more game against the Stanley Cup champions next Wednesday. That win pulled them within one point of Chicago (86) in the division, and three behind St. Louis (88). Colorado seems capable of matching up well with Chicago, the point total of their games 14-12 in favor of the Avs –the Blackhawks scored 7 of those 12 point in one game- but the Avs face a much tougher challenge in trying to unseat the Blues. In the two games the Avs have played against St. Louis, the Blues were the clear winners leaving the Avs to look like they didn’t belong in the same game. The Avs haven’t played the Blues since a 4-1 loss November 27th. Their one other game before that was a 7-3 loss two weeks earlier. Maybe the Avs can get over on the Blues Saturday when the Avs return to action after a few days without a game. Goaltender Reto Berra will join Colorado after being traded from Calgary for a 2014 second-round pick. I did not believe the Avs would make any moves and despite the one they did make, it still wasn’t much of one anyways. 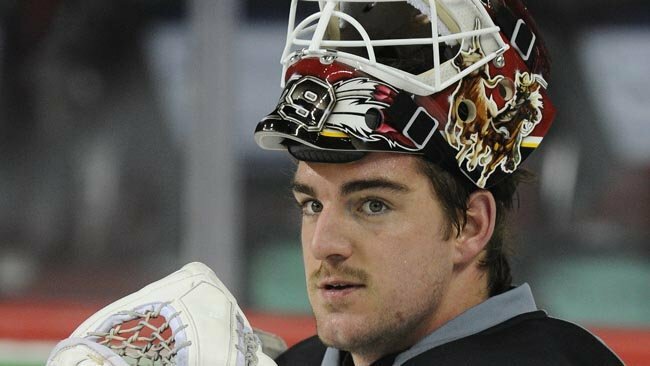 Joe Sakic and Co. sent a second-round pick in this year’s draft to the Calgary Flames for 27-year old Swiss netminder Reto Berra. He has posted a 9-17-2 record with the Flames in his first NHL season. He also started one game for Switzerland in Sochi, stopping 30 of 31 shots in a 1-0 loss to Sweden.